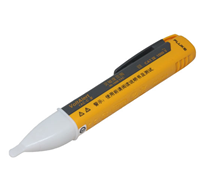 The next generation VoltAlert AC non-contact voltage testers from Fluke are easy to use — just touch the tip to a terminal strip, outlet, or supply cord. When the tip glows red and the unit beeps, you know there’s voltage present. Electricians, maintenance, service, safety personnel, and homeowners can quickly test for energized circuits in the workplace or at home.